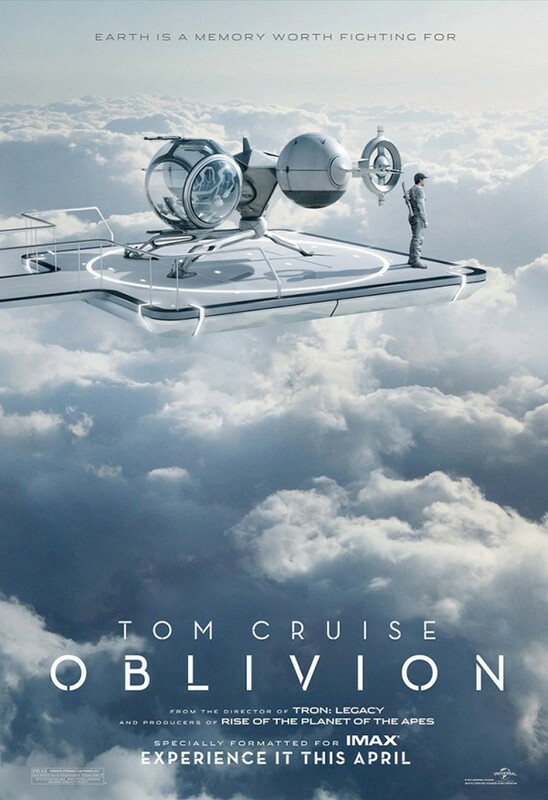 Movie review: Oblivion | What would Van Damme do? About midway through OBLIVION, I was slightly surprised, thinking that I wasn’t going to see Tom Cruise do what he does best – run very, very fast, very, very earnestly – seeing as how there were spaceships and other sci-fi elements that precluded him breaking into a sprint. Nearly five minutes after that thought, however, Cruise took off sprinting across the desert, signaling that while the film has some unique elements, at its core, it’s still a Tom Cruise Movie, complete with all the standard beats one comes to expect from such a production. Is that a bad thing? Not necessarily. As one of the few people who unabashedly loves “Tron: Legacy,” I was on board with whatever director Joseph Kosinski was going to bring to the table with this, his second film, and the visuals do not disappoint, especially in the crystal-clear IMAX format. Like “Tron,” your mileage may vary with the creaky story. Cruise stars as Jack Harper, who helpfully informs us at the beginning of the film that Earth fell victim in 2017 to a roving group of aliens called the Scavs, who, while during the war, destroyed the moon and wreaked havoc on our planet, forcing the population to flee to Titan, or a holding facility that looms over the planet called the Tet. Sixty years later, working with his partner/lover Victoria (an eerily effective Andrea Riseborough), Jack keeps watch on the planet, repairing monitor drones and patrolling the ruins of the world under the guidance of absentee boss Sandy (Melissa Leo). It’s a lonely life, one that Jack goes through with a great deal of wistfulness. Even though his memory was wiped, he still has flashes of a mysterious woman who appears in his dreams from a life that appears to be his. On his patrols, Jack collects mementos from the former planet, using them to help populate a homey lakehouse/man cave that’s a far cry from his spacey digs high above the clouds. Atmospheric, stunning, creepy and backed by a moody score from M83, the early part of the film is the strongest, with Cruise jettisoning some of his action star tendencies for a portrait of an everyday man with, literally, the world at his hands. I would have loved to seen the film explore this angle further, with Jack and Victoria coming to terms with their own madness and frustration with being stuck in this thankless mission on an alien planet. But $150 million movies don’t work like that. So, not only does Jack stumble upon his mystery woman when a UFO crashes on Earth, but it also happens to be his wife, Julia (Olga Kurylenko). And of course the Scavs are actually a clever group of human survivors led by the noble Malcolm (Morgan Freeman). It’s also very handy that the group’s plans need Jack to turn into an action hero in order to save the planet. You get the feeling that a flip was switched somewhere along the line, and all of a sudden “Oblivion” turned from a pensive character piece to an aggressively silly action/sci-fi hybrid. Now, I didn’t have a whole lot of trouble with this, simply because there are some nifty reveals to be had along the way and Kosinski’s visuals rarely stray from A-plus levels, but the film easily falls into formula territory, where you can predict the plot points as they come up. We all know Tom Cruise is slightly crazy, but the guy gives his ABSOLUTE, ALL-CAPS ALL in every movie he’s ever done, and here is no exception. Jack is a character with deeper layers than the typical man-of-action, and while that gets scrubbed away down the stretch, Cruise is more than capable of pulling that off. Aside from a groan-worthy ending, “Oblivion” is a solid flick that’s greatly aided by the components around it – the visuals, atmosphere, music and concept – rather than the hard-and-fast blockbuster elements it must contain in order to be successful. But that Tom Cruise really can run, can’t he? ~ by Elliott on May 1, 2013. Starts off perfectly, but soon dissolves into sci-fi convention, after another. Nice review.